I’m excited to have Faith Blum join us on Honey Rock Hills! Faith has authored several Christian novels based on the western mail-order bride saga, including her latest release, The Solid Rock. I recently came across Faith’s work and am so thankful for the opportunity to chat with her today. Kenzi: First question to get us rolling is how long have you been writing and what sparked your desire to be an author? Faith: Well, I’ve been writing for a while, but I didn’t really start seriously writing until 2013. I’ve always enjoyed writing, and wanted to be an author, but thought it was an unattainable dream until I found out about Self-Publishing. Then I definitely got much more interested in becoming an author. Kenzi: How did you come to faith in Christ and what role has He had in your writing? Faith: I came to faith in Christ when I was 4 and while doing dishes with Mom. God is the whole reason I am doing writing and how it is going so well, really. Without God, I wouldn’t have gotten any of the inspiration for any of my books and I wouldn’t have been able to write any of them with as much impact as I have. Kenzi: I love your theme of coupling the hymns with the Old West! What inspired you to blend those two worlds together in your books? Faith: As I edited A Mighty Fortress (then called Hold Fast, Stand Firm), I noticed that I had inadvertently put the hymn in the book multiple times either by just mentioning it, having them sing it, or whatever. Plus the theme of the hymn ended up being the theme of the book. After I decided to write a series, I thought Hymns of the West sounded like a unique series name, so I went with it. Kenzi: What is your favorite part about bringing a story from conception to completion? Faith: Writing the rough draft. Seeing a story grow from just a small idea to a full-length novel is a fun experience and along the way, you get to learn new things about yourself, your characters, and history (at least for a historical fiction author). It’s a lot of fun. And a lot of hard work. Kenzi: During your early years as an author, did you have any mentors or authors you especially looked up to? Faith: I didn’t really have any mentors, but there were two authors in particular I did look up to and who got quite a few questions from me: Aubrey Hansen and Jaye L. Knight. Perry Elisabeth was also a great help, though I didn’t quite realize she was an author at the time. Kenzi: Which has been your favorite novel or novella to write, and why? Faith: I have two, I hope that’s okay. The Solid Rock and Blessed Assurance. They are both mysteries, which is probably one of the reasons why I liked them so much. The mystery genre is one I hadn’t really considered writing in mainly because there is so much planning needed (I thought) to get it all to work out well. Then I wrote The Solid Rock without having any idea myself what the villain was planning or how it would all go down. A bit risky and I don’t necessarily recommend it, but I think it worked. Blessed Assurance is one of the spin-off novellas based on a minor character in The Solid Rock and is also a mystery. Writing TSR, I fell in love with Adelaide and couldn’t wait to write her story. After writing her story, I liked her even better. Her story will be published in August 2016. Kenzi: hat is your favorite resource for historical research? Internet, books, DVDs, etc.? Faith: It really depends on what I am researching. I mostly use the internet, but I also get some books occasionally. Kenzi: What are some of the most important lessons the Lord has taught you in your writing journey? Faith: Trust God to take care of everything. I published my first book before I got a part-time job. My part-time job paid for the publication of my second and third books and then I decided to take a leap of faith and quit my job. Since then, God has blessed me as I trust Him to provide what is needed. Kenzi: You have just released your latest novel, The Solid Rock. Please tell us about The Solid Rock. Faith: The Solid Rock is a novel about a young man with a tough job: infiltrate an outlaw camp to find out what is going on. Joshua reluctantly does so after a bad experience with going undercover less than two months before, but he has no choice if they want to catch the outlaws. He anticipates only being undercover for a few days, so when he finds out the outlaws are part of a larger group and he is forced to stay undercover for weeks, he starts running into too many moral dilemmas. Will he stand on the solid Rock or drown in the sinking sand? Kenzi: What advice would you give a young aspiring author? Faith: Just keep writing. Read books on writing and editing. If you have a good grasp on writing style and grammar, you will be more likely to succeed. Kenzi: What are a few of your favorite things to do when not writing? Faith: Read, knit, crochet, play games with my family, watch movies (while knitting or crocheting), and play piano. Kenzi: A perfect day for Faith would be...? Faith: Eat breakfast, practice/play piano for an hour, write for a couple hours with no distractions, eat lunch, do T-Tapp, write or edit for a few more non-distracted hours, eat supper, play games with the family, and maybe talk to a friend on the phone. Kenzi: If you could change anything in the world, what would it be? Kenzi: Thank you so much for joining us, Faith! Anything you would like to add in closing? All of Faith's books are available through Amazon. 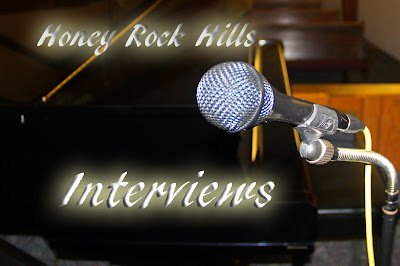 Click the link below to find out more about The Solid Rock, A Mighty Fortress, I Love Thee and many more. Faith Blum started writing at an early age. She started even before she could read! She even thought she could write better than Dr. Seuss. (The picture doesn't show it well, but there are scribblings on the page of Green Eggs and Ham). Now that she's grown up a little more, she knows she will probably never reach the success of Dr. Seuss, but that doesn't stop her from trying. When she isn't writing, Faith enjoys doing many right-brained activities such as reading, crafting, writing, playing piano, and playing games with her family. One of her dreams is to visit Castle City, Montana someday to see the ghost town she chose for her characters to live in. She currently lives on a hobby farm with her family in Wisconsin. Want to receive our weekly posts and resource updates? Sign up here! I enjoyed the interview and learning more about your day to day life. You are always busy but willing to help others. Thank you for reading - and sharing your encouragement - Onisha!